Workflow diagrams are a visual representation of a work process. Most commonly used for implementation or documentation purposes, the diagrams help describe each stage of the work process, including the conditions which need to be met for the process to continue to the next stage. This visualization helps both people and machines to follow through processes eliminating the risk of mistakes. The start of the workflow diagram is the beginning of the workflow process. It can be a particular event or a need. Examples would be the need to hire a new person within a company or to replace a current employee, it can be the need to purchase new supplies for the company, the order shipping process, and many other. For the purpose of this example, we'll go through the workflow process of dealing with incoming email messages. 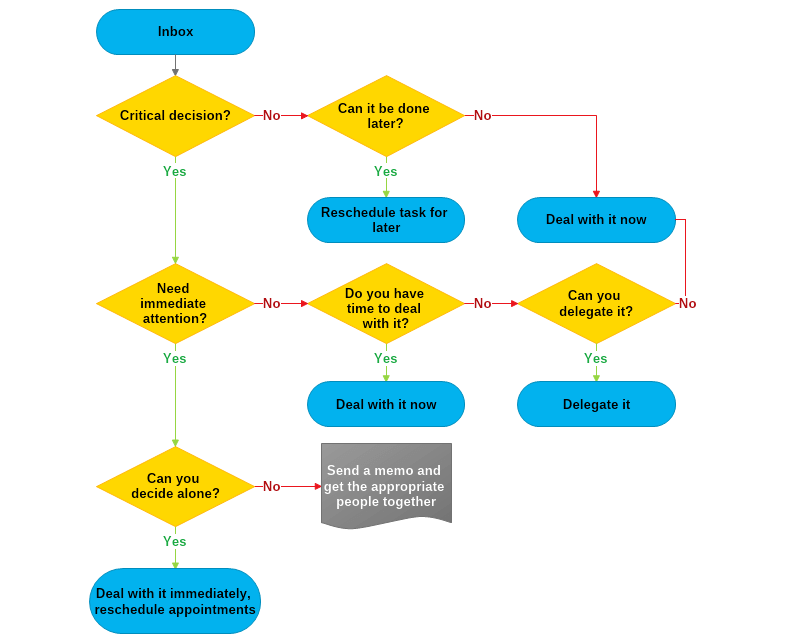 Since workflows are actually flowcharts, the next logical step would be to provide a decision flow, which follows the beginning of the process. The initial decision step would be a condition, which will send the viewer (executor) of the workflow in a specific direction. In our example, the viewer needs to decide whether the incoming email requires her/him to take a critical decision or not. Based on this decision, continue onwards. By this stage, the workflow diagram is becoming clearer. Now is the time to dive in depth and ensure that each stage and each possible outcome is written down. Workflow diagrams don't limit you to only one possible outcome - you can have as many, as the process requires. In this particular case, there are 6 outcomes, 3 of which overlap but under different conditions.